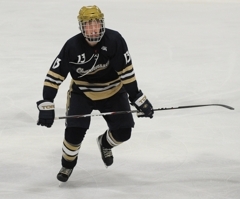 During the 2010-2011 season, Chanhassen forward Connor Kelly scored 43 points (24 goals, 19 assists) with the help of four hat tricks but the senior had yet to score those elusive three goals in one game this year. That is, until the Thursday, Jan. 5, game against Chaska. 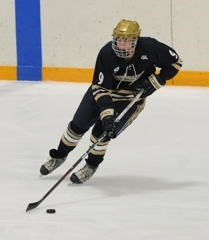 Within a timespan of exactly four minutes during the second period, Kelly scored his first hat trick of the year leading the Storm to an 8-0 victory over their rivals. Despite Kelly’s points total last season and already off to a great start with 20 points (13 goals, seven assists) in eight games so far this year, the senior may not have received allt he attention he deserves. Something Wilson was quick to point out. “(Kelly) and (Nate) Traina are pretty skilled players but I think that because they play at kind of a smaller school they get overlooked,” Wilson said. “Connor didn't make the Elite League; had 43 points last year. He's going to put up a big number this year. He's a spark plug. 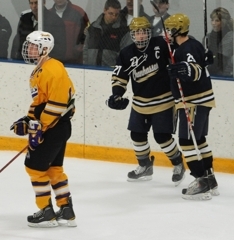 Thanks to their combined efforts, Kelly and Traina were able to lead Chanhassen to a victory in a heated rivalry game. Though the score was obviously in his team’s favor, Wilson was more pleased with the effort he saw during the victory. “I thought our boys played hard,” Wilson said. “We wanted to take away the shooting lanes and really play disciplined -- we took a couple penalties I didn't think we should have. 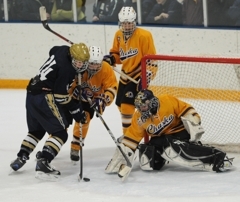 Now posting a 6-2-0 record, Chanhassen is hoping to continue to turn heads throughout the season. 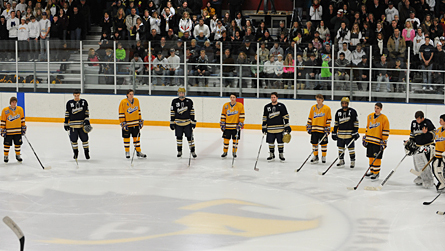 After starting rosters were announced and the National Anthem was played, all skaters from both Chanhassen and Chaska met at center ice and formed a circle in front of the packed Chaska Community Center. Standing together in mixed formation with barely any players from the same team standing next to each other, both teams bowed their heads for a unified moment of silence in honor of paralyzed Benilde-St. Margaret’s forward Jack Jablonski. “The kids have been talking about it,” Chanhassen coach Chris Wilson said about the spinal cord injury to Jablonski. “(Chaska coach Mike Johnson) and I talked earlier today about what to do and he came up with the idea, I thought it was great, not only for 'Jabs' but for our community. All these kids played together all the way up and all the youth kids need to see that we're still one community. One of the more touching tributes was by the players themselves inscribing ‘Jabs’, ‘Jabby’ or ‘13’ (Jablonski’s number) on their sticks. 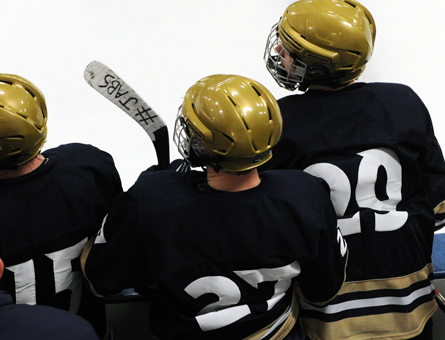 Chanhassen senior forward Connor Kelly had ‘Jabs’ written on his stick blade. “I threw it on my stick so everyone could see it and get the word out so they can show their support for him and his family,” Kelly said. “It's really tough. When a kid in the hockey community goes down, you really think of your life and what can happen and things we take for granted. He lost everything, he can't play the game he loves. Along with showing his support for Jablonski and raising awareness, Kelly’s new stick design also benefitted himself as well. “I had a game not too long ago where I didn't get any goals,” Kelly said. “I threw the 'Jabs' on the stick and then got three right there so I think it might have had something to do with it. 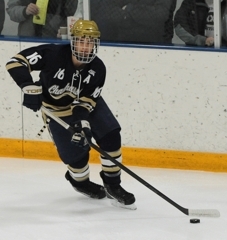 While Kelly’s three goals were a welcome commodity for Chanhassen, Wilson noted that the tribute was not about scoring goals and collecting hats. “(Kelly) took a stride towards the fans after the hat trick, one stride, and then he remembered the 'Jabs' deal and came over to the bench to celebrate,” Wilson said. “It may sound trivial but high school kids love to celebrate goals. We got a big student fan section here so our guys are inclined to celebrate in front of the students obviously. Our tribute was we wanted to celebrate just as a team and they came back to the bench and celebrated as a team and guys were pretty excited. While the Storm are looking to build off of the momentum from winning the rivalry game, Kelly noted that there are additional factors fueling Chanhassen. After suffering a tough 8-0 loss at the hands of Chanhassen in the heated rivalry game on Thursday, Jan. 5, Chaska coach Mike Johnson took some time to speak with the MN Hockey Hub about the game, the Hawks’ opponent and the pregame tribute to paralyzed Benilde-St. Margaret’s player Jack Jablonski. Question: The final score is obviously not what you wanted but what were some good things you saw out of your team in the game? Answer: Our guys had good energy to start out. 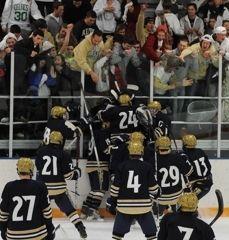 It's a natural rivalry game -- guys are excited and (Chanhassen) is excited. Their team is a lot like ours was last year, a lot of seniors and a lot of experience. We made some mistakes that we'd like to have back, but at the end I liked the way our guys competed through the end. They didn't give up even though the score was a little bit higher than I think they would have wanted. It was a good rivalry game, a good atmosphere, I mean the place is still pretty much packed trying to file out. Q: With the score being lopsided and the Chanhassen players celebrating their goals and the victory, did you think the Storm displayed poor sportsmanship, were rubbing it in and/or running up the score? A: No. I mean, looking at who they were throwing out pretty much the entire third period -- their top two lines are as good as a lot of big Class 2A school's top two lines and we didn't see them out there more than once in the third period. We saw a lot of kids (in the third period) that we saw play some junior varsity. No, I didn't think they ran it up. I know (Chanhassen coach Chris Wilson) and he knows a lot these kids from being in the community. Given that it is a rivalry, I'm sure the kids wanted to keep going on his side but kudos to them for playing really well and they obviously didn't rub it in when it was out of hand a little bit. Q: The high school hockey community in Minnesota has been shaken by the injury to Jack Jablonski and it was great to see the pregame tribute. What has this past week been like since the injury occurred? A: It's one of those unwritten rules -- no athlete ever wants to go to the hospital to visit another athlete. All the kids know about it. We talked about it and reiterated the safety piece. Whether it's in practice, or in games, or a big rivalry game; if you see someone's back, just lay off; as meaningless as it might be. A lot of the (Chaska) kids figured out along the way that this isn't just about winning or losing, day-in and day-out. It's about learning about life and to see a kid their age have something that he's dealing with right now that's difficult, I think it hit home with a lot of them. They didn't necessary talk about it a lot but you could tell it was on their minds. Q: Who organized the pregame tribute to Jack? A: (Chanhassen coach Chris Wilson) and I go way back a-ways. We've known each other since I was about 10-years-old. We talked a little bit today about what we could do and we threw up (No. 13) jerseys on each of our benches and we talked about more from the safety perspective doing something beforehand. It was really a collaborative effort with our PA announcer really wanting to say something during the game and I had this idea of getting both the groups together. It was a combined effort. Regardless of what team you may have been cheering for at Chaska Community Center, it was hard not to take a few minutes to chuckle at a situation that can only be described as ‘the disappearing puck’. 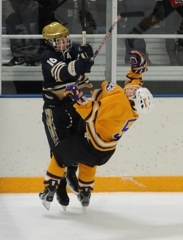 Mid-way through the third period of the Chanhassen/Chaska game on Thursday, Jan. 5, a broken play by Chanhassen led to an odd man rush for Chaska. Within seconds a quick shot flew towards Chanhassen goaltender Harlin Paradise from the Storm netminder’s left that ricocheted off his right shoulder. Play stopped and the officials swarmed in on Paradise to find the missing puck. Yet after several minutes of digging through his pads, glove, blocker -- heck, even the net -- no puck could be found. This left Paradise in a somewhat awkward position. “Take it off, take it off, take it off” chants started to ring out from the Chanhassen student section referring to Paradise’s jersey and chest protector. A request that eventually the Storm goaltender obliged as the officials stood in wonderment of where the lost piece of rubber could be. Finally, the puck resurfaced in quite the unlikely place. 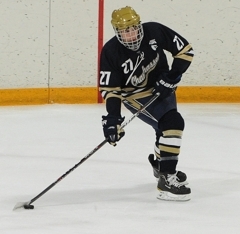 Connor Kelly scored a hat trick in the second period leading Chanhassen to a 8-0 victory over Chaska on Thursday, Jan. 5, at Chaska Community Center. Eleven additional players on the Storm registered at least one point in the heated rivalry game -- including Nate Traina, Logan Wilkinson and Jake Anderson who each scored a goal and had an assist. 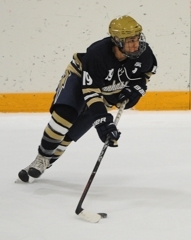 Chanhassen senior defenseman CJ Oddsen had two assists on Kelly's second and third goals. 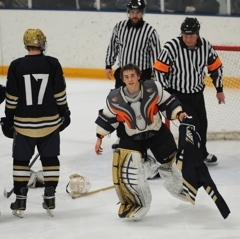 Junior goaltender Harlin Paradise settled in early for Chanhassen making 18 saves for the shutout victory with the possible exception of a brief stoppage of play in the third period when neither players nor officials could find a loose puck in Paradise's equipment. The puck would eventually resurface a few minutes later in the breezers of sophomore defenseman Michael Gmiterko but not before Paradise had removed and shaken out his jersey and chest protector. After the Hawks' starting goaltender Thomas Hanson allowed three goals on six shots, Chaska coach Mike Johnson called on sophomore netminder Blake Johnson to replace Hanson with 6:02 remaining in the first period. Johnson would finish with 25 saves. Prior to the game, both teams met around the center ice logo for a moment of silence in honor of Benilde-St. Margaret's sophomore forward Jack Jablonski who suffered a paralyzing injury during a junior varsity game on Friday, Dec. 30, 2011. Each team also hung its respective No. 13 jersey -- Jablonski's jersey number -- behind its bench in tribute. 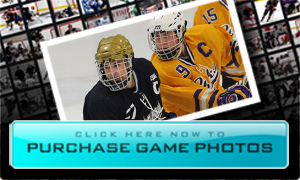 Looking for its first Missota Conference win, Chaska (2-10-0) will travel to Schmitz-Maki Arena to take on Farmington at 7:15 p.m. on Tuesday, Jan. 10. 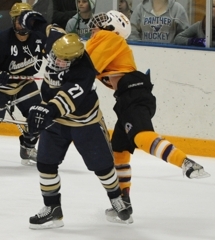 Chanhassen (6-2-0) will not have long to enjoy the victory as the Storm will do battle against Blake on Friday, Jan. 6, for a 7:30 p.m. game at Blake School Ice Arena. The senior forward and Storm leading scorer was held completely off the scoresheet in the first period. Kelly responded by scoring a hat trick in exactly four minutes and he did so with "#Jabs" written on the tape of his stick blade in tribute to paralyzed Benilde-St. Margaret's sophomore Jack Jablonski. Kelly played excellent at both ends of the ice when he wasn't drawing heavy attention from Chaska defenseman and though he dominated the second period, Kelly -- aided by coach Chris Wilson's direction -- was humble to take one, quick 30-second shift in the third period let the lower lines finish out the game. 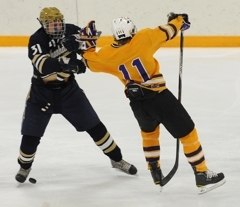 Playing shutdown defense all game, Oddsen made it nearly impossible for Chaska to gain any momentum in the Chanhassen zone. Along with breaking up passes, blocking shots and checking hard, the senior defenseman also contributed two assists to Kelly's second and third goals. 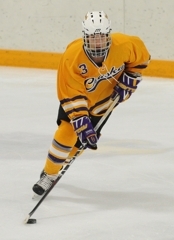 Showing off some impressive puck handling as well as a laser-fast wrist shot, Traina was a constant headache for the Chaska defense. 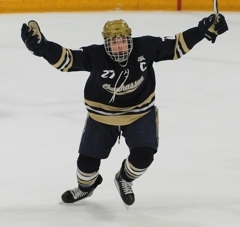 The senior forward scored Chanhassen's first goal which set the tone for the remainder of the game and proved to be the eventual game-winning goal. Traina also had an assist.